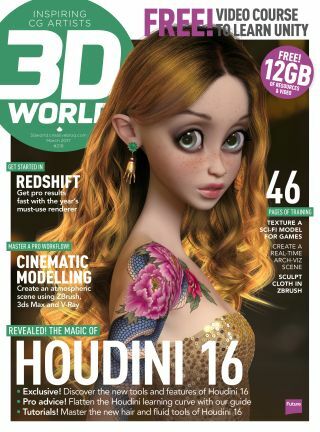 3D World issue 218 exclusively reveals Houdini 16, its new tools and how to use them. If you work in VFX, animation or video games, or want to, then at some point you’re going to need to use Houdini. It’s the industry standard. This issue, the 3D World teams takes an exclusive look at the new features coming your way in Houdini 16, and they’re impressive. New Ocean, Hair and Fur tools and auto-rigging for animators are just a taste of what’s in store. If you’re new to Houdini then you’ll want to read Mark Spevick’s advice on flattening the learning curve, and if you use Houdini and want to try the new features we have exclusive tutorials for the new Hair and Fur, and Fluid Suction tools. Order a copy of 3D World 218 today! It’s not all about Houdini. This issue’s tutorials cover pro advice to get more from Redshift, training to hone a ZBrush/3ds Max/V-Ray workflow and learn to create a real-time arch-viz scene using Unreal Engine 4. Tutorials come with files, video walkthroughs, models and more to follow the training. Once again, we’ve partnered with Pluralsight to offer a free video course. This issue we offer a course to create destruction simulations in Unity 5. The download includes the full video course and project files.